Chakiza Cummungs was the lucky winner of a Y5,000 gift coupon to Esthetique Salon Come Across. 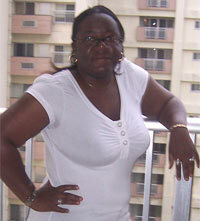 She is from North Carolina and has been on Okinawa almost one and half years. She says she likes the place, and her favorite pastime is shopping. 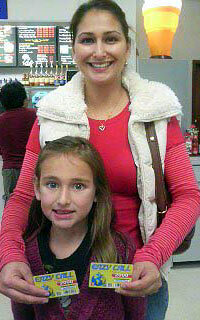 Lisa Stone and her daughter Kaitlyn are from Texas, and have been on Okinawa one year. She can now make plenty of phone calls to folks back at home as she won \4,000 telephone tickets courtesy of Eazy Call. Linda says they both like Okinawa a lot. On her free time she volunteers at a school and cooks.